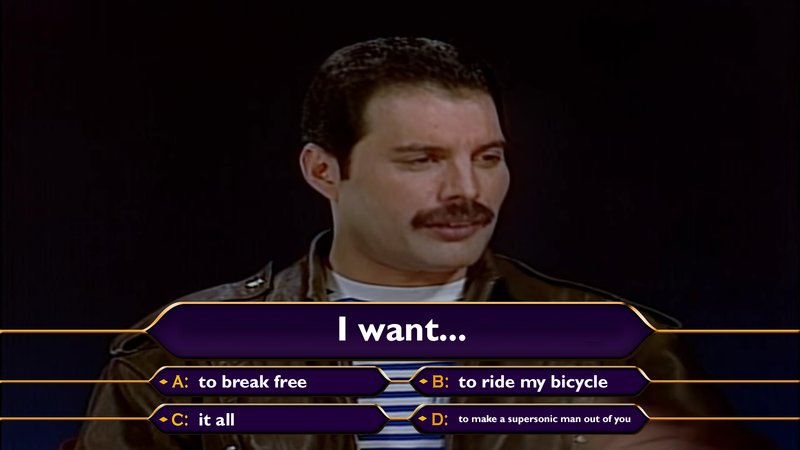 MGTOW Meme Sunday: Freddie Mercury holds up the world? So I ran across this cartoon on the Men Going Their Own Way subreddit. I guess it’s supposed to be a tribute to MEN for doing all the hard work that keeps the world going while women eat bonbons and play with children, or something. But I’m pretty sure that’s Freddie Mercury there. So I guess we all owe Freddie a huge debt of gratitude. Thanks, Freddie! Freddie’s huge pie is utterly ruined now! I want to know why Freddie is in the ocean holding up Mary and Jesus. Does that make Freddie Mercury Joseph? Or does it make him God? I’m pretty sure Mary, Joseph and Jesus weren’t from India. I’m okay with Freddie Mercury being God. Funny, my dad lived 83 years, but never once did I hear him talk about sacrifice, ever. Also, he didn’t look a thing like Freddie Mercury. I am sort of OK with a religion that features Freddie Mercury bearing the Madonna and Child across the ocean, perched on a trash can lid. Sorry, MGTOWs, this isn’t the real life. This is just fantasy. I think we can all agree that Freddie Mercury is a god. Excuse me sir, do you have a moment to hear the good news about Queen? Another meme bites the dust. Is this why England people say God saves (the) Queen ? I’m pretty sure boats and rafts exist. We did use them to cross the Bab-el-Mandeb Strait during one of the early human migrations out of Africa 125,000 years ago. * Sure, the water was shallower and the strait was narrower back then thanks to the ice age, but it wouldn’t have been shallow and narrow enough to walk through. It definitely wouldn’t have been possible to walk through while supporting a full grown woman and a baby on your head. Nope, they used boats, which were used as seafaring vessels as far back as 900,000 years ago by our ancestors, Homo Erectus. ** Yep, they definitely exist and have existed for a VVEEERRRYYY long time. Talk of fathers and sacrifice just reminds me of Abraham and Isaac. Not that my Dad wasn’t a lovely man, and my ex was a lovely Dad to his daughter and Mr Bluecat is a great Dad to his kids too. And do you know, not one of them ever bellyached about “making sacrifices” – they were too busy being Dads and bringing up their kids. No! Don’t you dare try to claim Freddie Mercury as your own, migtoes. He doesn’t belong to you. Yeah, so, I’m pretty sure that meme’s supposed to evoke Yashoda and infant Krishna, not Mary and infant Jesus (though there isn’t a Joseph-figure in the former). Technically, neither was Freddie (he was born in Zanzibar to Parsi parents). @Ariblester, I wasn’t suggesting that Freddie was Indian. I noticed the “Utkal” on the cartoon, and guessed it was from Odisha. Reminds me of the other meme that had a very similar message, except that it didn’t have a good case as it mentioned a whole litany of fictional people as it’s evidence. It’s a ridiculous meme. Nothing is stopping fathers from loving their children. Nothing, that is, except the toxic alpha mindset that says in order to raise manly sons, dads have to be distant authoritarians who bond with their male offspring only on weekend outings, preferably over the corpses of slain animals. You know, the toxic alpha mindset that these guys ferociously defend at all costs. It’s an entirely self-created problem. Ah, I misunderstood. My apologies. @Buttercup, don’t forget the caviare and cigarettes. Would it be sacrilege to say that my favourite Queen song isn’t even a Freddie one? Brian May wrote ’39, and sings the lead. There are a lot of Queen numbers which make me smile, but this is the only one which brings a tear to my eye. @Moggie, yes, my unseen toiling ocean porter keeps me well supplied with caviar and cigarettes. I give them to the baby, of course. ’39 is one of my favorites too. Such a haunting song. It makes me want to go reread “Time for the Stars”. ’39 is my fave, too. The versatility shown on A Night At The Opera is mind-boggling!! Video Director: OK people! Here’s how it’s going to go. Freddie, you’re in the pool holding up the trashcan lid and looking confused. Brian, you’re perched on the lid dressed as the Madonna and cradling an infant onto whose face we’ll superimpose John’s face. And Roger… where’s Roger? What do you mean he’s gone out for crisps?! Well, who is going to play the merman then? The metaphor doesn’t work without a merman! OT – Katie Hopkins has filed for insolvency due to the financial impact of losing a libel case. Apparently there are, in fact, sometimes consequences for being a flaming garbage person. Happy dancing here. She is one of the few truly irredeemably vile people out there. And … I’ve been enjoying a week of no twitter, no politics – for some reason the 9/11 stuff hit me hard this year. Why did Daddy Mercury carry his partner and child out into the ocean? I’m waiting for some brave MGTOW to pen “Mercury Shrugged”. A couple of years ago we went to a Rick Wakeman concert in Tenerife, with a guest appearance by Brian May. Much as I enjoyed Rick Wakeman, the high point was Brian doing his thing with delays while members of rick Wakeman’s band drooled as much s the rest of us. And then he sang ’39. Even so, I think I love “Fat Bottom Girls” even more. In fact I floated the idea that a group of us would take along a banner reading, “Fat bottom girls love the Big Bang!” because we’re all large astrophysics nerds. When there was only one set of footprints… it was then that Freddie Mercury carried you.